Zimbabwe’s hopes of reaching the Afcon finals for the second successive time suffered a setback when they lost 1-0 to Liberia on Sunday. The Warriors needed at least a draw to seal their qualification, but the defeat saw their lead on top of Group G reduced to within a point as the west Africans move in the second position with seven points. Zimbabwe dominated possession throughout the first half with Marvelous Nakamba winning more balls on the midfield. They created some good chances, but striker Tinotenda Kadewere failed to hit the target after getting two glorious opportunities. Kadewere’s first effort came on minute 18 when his tame shot gave no trouble to the keeper. He returned again towards the half-time when he decided to shoot when Knowledge Musona and Ovidy Karuru were in space unmarked. Liberia also made some attacks, but never brought any threat towards keeper Edmore Sibanda as the Warriors’ backline remained disciplined. The second period had a cagey start with both teams failing to reach for the goal. Sibanda almost gifted the Liberians with an opener on minute 69 when his clearance was blocked, and the ball fell on the way of Laffor who hit straight at goal. The keeper recovered well with an acrobatic save to keep the visitors in the game. Nonetheless, the hosts got into the lead three minutes later when captain William Jebor taped in a cross from the left. 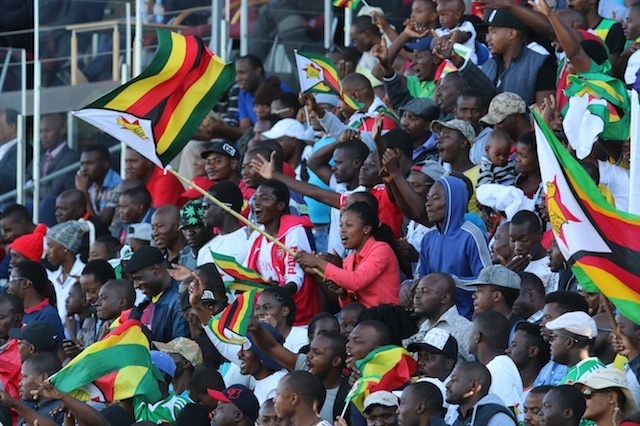 Zimbabwe tried to get back into the game but failed as they conceded their first defeat of the campaign. Meanwhile, in another Group G game played today, DRC and Congo played to 1-1 draw. The result put DRC in the third position while Congo slump to the bottom of the table with five points.